NEW YORK: American families are taking a healthier approach to food shopping, but those shopping for convenience and to appease children find it more difficult. NEW YORK: American families are taking a healthier approach to food shopping, but those shopping for convenience and to appease children find it more difficult, according to a recent M Booth study. The Better4You Shopper Profile Survey, released by M Booth's Better4You practice, found that 52% of those surveyed said their purchases are healthy and 42% of families said their children are eating better than they were two years ago. The reported analyzed 1,125 online interviews conducted in August 2010 among US adults. 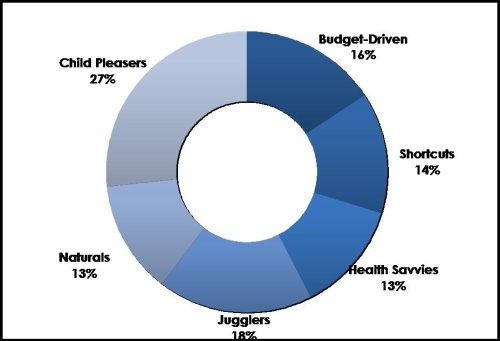 It also broke the respondents down into six different segments: child pleasers, jugglers, budget drive, short cuts, health savvies, and naturals. Thirty-two percent of those in the short cuts group and 48% of those in the child pleasers group find it more challenging to keep purchases healthy. “Parents are in a transition of trying hard to move into healthier eating habits, but old habits die hard,” said Joyce Yaeger, co-director of Better4You. Across all segments, food labels were the most important factor considered when making a purchase, with saturated fats, sodium, and trans fats being the biggest red flags. The study also broke down the six segments to outline the different habits of each group. For example, child pleasers try to sneak healthy foods into meals, but family dynamics are placed over health, so overt messages about nutrition won't resonate with that group. Jugglers try to balance, cost, nutrition, and child preferences, but cost is most important. Budget driven shoppers cook more meals from scratch than any other group. The short cuts group will shop for quick and simple over natural foods. Health savvies rely on labels to choose the healthiest products, and naturals are happy to pay a premium for healthy, natural foods even in a down economy. “This insight allows brands to match up with the different groups and drill down to say these are the types of messages that will reach this specific group,” Yaeger said. Rich Goldblatt, co-director of Better4You, said the new dietary guidelines coming out are just one of the triggers that will keep healthy eating and food shopping on the minds of consumers through out the year.